So there I was thinking I was completed by the availability of OliveTree Bible App in the store. Combined with the YouVersion Bible App you would have thought it couldn’t get better than this, in drops the Bible Pronto app to add another dimension to the Bible experience on the Windows 8 Metro platform. Bible Pronto allows annotation and highlighting of the bible verses, a feature that is currently missing on both aforementioned apps. You can find Bible Pronto in the Reference section. Letup: The app is ONLY available on the Intel devices! Sorry for those of you on ARM devices, hopefully they’ll still port to ARM before Windows 8 goes gold. New version will be out in couple of weeks which will include better reading experience. Skydrive backup and restore if your notes, bookmarks and higlights. Really nice to hear. I am already impressed with your initial features already. BiblePronto already surpass competition in the Store. Nice to hear you’re actively developing the app, not just a me too app! Keep up the good work! – In Version 1.1 we have added features, bug fixes and included performance fixes. – We have completely reworked the bible reading experience to support full panoramic reading taking full advantage of your device resolution and form factor. This fix is also applied to the parallel reading mode. – App now works in both Landscape and in Portrait modes automatically scaling to the device resolution. – Added SkyDrive Backup and Restore feature. Now you can backup your Notes, Bookmarks and highlighted verses to the cloud to get complete roaming experience on any device. – Added New English Translation to the Bible Version. Please use the settings charm to manage your local Bible versions. Sync the bible version first and download. – Pinned verses now directly open the scriptures in reading mode. – More versions coming soon…. Nice job! Awesome feature updates too. I like it. Posted the update. 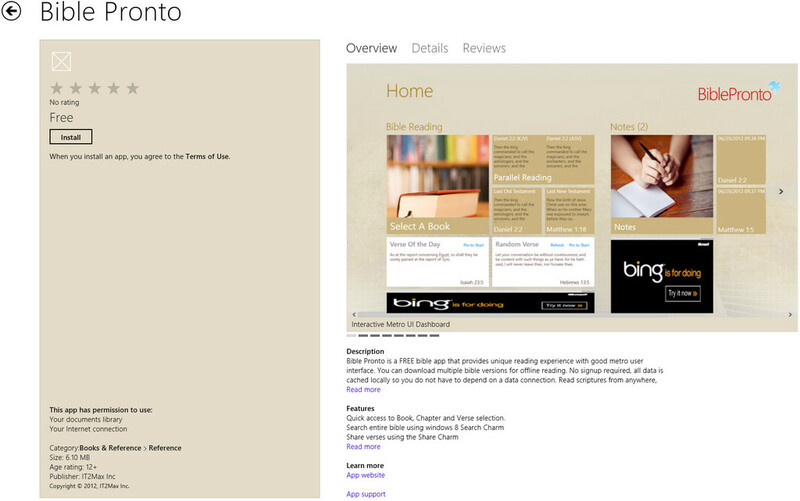 Bible Pronto is now available on windows phone 8 store now. Wow! Congrats. Definitely getting this. Best Offline Bible App now on Windows Phone 8. More features coming soon. Please review and rate!